Comfortably relax and enjoy a good book from the comfort of your living room in this chair. 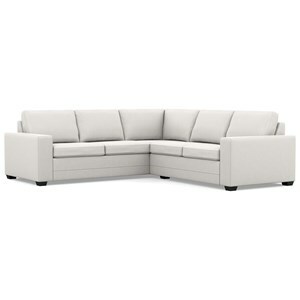 Wide track arms and low profile legs offer a modern look to the piece. A solid frame provides the support you need while memory foam topped cushioning adds excellent comfort. The Inspirations Contemporary Chair with Wide Track Arms and by Palliser at Belfort Furniture in the Washington DC, Northern Virginia, Maryland and Fairfax VA area. Product availability may vary. Contact us for the most current availability on this product. Padding & Ergonomics Standard Comfort: Memory Foam Top. Premium Comfort: Feather Fibre Wrap. Create a look that's all your own with the fully customizable Inspirations by Palliser line. Building off of Palliser's expertly crafted, made in Canada motion and stationary upholstery, Inspirations lets you take the design into your own hands, by choosing from a variety of options to determine the size, silhouette, and color of your creation. Start by selecting your arm style and leg style, then pick from a variety of shapes and sizes, with options for chairs, sofas, loveseats, and a variety of sectional configurations. Hundreds of fabric and leather options let you capture the perfect color and feel, while extra features and accessory options provide the finishing touch. The Inspirations collection is a great option if you are looking for Contemporary furniture in the Washington DC, Northern Virginia, Maryland and Fairfax VA area. Browse other items in the Inspirations collection from Belfort Furniture in the Washington DC, Northern Virginia, Maryland and Fairfax VA area.